They day has come. The quilting is finished. In fact, to keep me from overthinking this quilting any more (I could nit-pick, remove and restitch for what seems like forever, but the reality is that I am just NOT that vested in this quilt), I took it off of the longarm frame and proceeded to immediately cut away ALL of the excess backing and batting -- making it nearly impossible to reload it even if I wanted! Take that as my drastic, "I will not overthink" anything else on this quilt move! 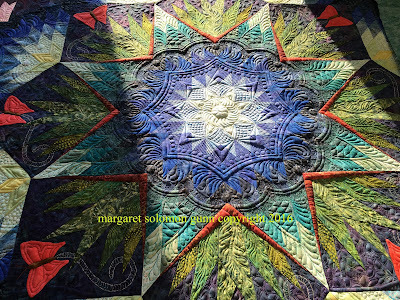 Many of you think that because the quilting is finished, that the quilt is essentially done. Unfortunately, I know all too well that there really is a considerable amount of time left getting this blocked, bound and ready to send off to its first show. I thought I'd take this post to show what I am doing on that process, and document the actual time spent. So, first things first -- Blocking the quilt. 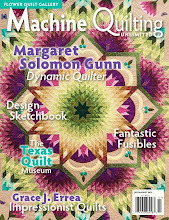 I have documented the blocking process before, and wrote an article for Machine Quilting Unlimited that ran last year sometime. This quilt is a little different though. I pieced it 4 years ago, before I put an ounce of thought into prewashing fabrics, or if a material might bleed. The bulk of the piecing was just a few weeks before I blocked Rainbow Nouveau for the first time and watched it bleed so horribly. So, going into this blocking process, I have no fears, but I am taking the process a little differently. I enter into it not thinking that this will bleed, but KNOWING that it will. I put the quilt into the absolute hottest water bath I could run in my large tub. Into this water, I added about 1/4C of Dawn dish detergent. This is the cheap alternative to Synthrapol, which I cannot find in 15 minutes at my local grocery. I add the quilt, and then submerge it with a partially filled laundry basket. Suspicions confirmed...look at that water! This soaked for 45 minutes or so and the water had that much dye in it. The Dawn keeps the extra dye suspended in the water, and not in the fabrics that are not blue. Knowing that there is more dye to remove, I repeat this process. The first bath is drained, and a second hot soak with Dawn is prepared. The quilt soaks for another hour or so. The water (below) is still tinged slightly, but I am pretty sure that there won't be enough dye left to bother with a 3rd hot soak. I drain the water, and then draw a 3rd bathtub, but this time it is fuller and it is cold water. I add no Dawn, because I want this soak to be to remove the soap from the quilt. After an hour, the tub is essentially clear, so I declare the process done. The quilt is removed, rolled with 7-8 towels on either side of it to absorb as much water as possible, and then taken down to my basement to be blocked. I block on 1-1/2" foam-core insulation boards. The quilt is pinned to these boards, taking care to get it very square. I use measuring tapes, a laser level, and rotary cutting squares. I won't go thru this process, as I have before. Suffice it to say, being on your hands and knees pulling and pinning is hard on all parts of you from your fingers to your back and knees. I ached the next day! I set a couple of fans to blow on the quilt to expedite the drying process, hoping sincerely that there would be no bleeding as the quilt dried. How long did this take, you wonder?...To soak -- 3-4 hours. To pin it down squarely -- about 1 hour. To Completely Dry -- 2 days. It is faster in the summer (my basement is warmer than 63F then), but one cannot alter the seasons. While it was soaking, I started on preparing the piping for the piped binding. So let me take you now on the process of how I go about putting a piped binding on this quilt. I decided actually to do a double piped binding. This is a first for me. It may be a major crash and burn, as this adds extra thickness under the binding, but I am seeking something challenging that will both look good AND maybe bring the quilt extra points. Quilts at the high end are won and lost by small things like finishing. I don't think that this is necessarily one of my better quilts, so something extra is maybe a good thing. First thing I decided to do was make a small mock-up. I pulled a scrap of already quilted fabric that would be on the side of my quilt. You know - this is from the scraps I use to test tension every time the thread is changed. By the time I am done with a show quilt, the entire side of my quilt on one side is lined with 3-4" wide strips. I cut it off, marked the scallops (yea...another scallop-edged quilt), and stitched on the double piping. My goal in this is twofold: I want to be sure that I can actually make the scallops with two layers of piping AND I need to determine what width of binding to eventually cut (that is, when it arrives. It had to be reordered because I used all of the fabric on the quilt). So...45 minutes later (that's what it took to make the sample with 2 scallops)... As you can see, I am contemplating possibly doing some decorative stitching in the silver metallic thread. I tested a bunch of patterns on my scrap. It will be much harder on a heavy quilt, so I am holding off for right now. It will also be a very slow process, that would not be easy to remove should it not go as desired. Piping... No make that Double Piping...Because I am very fabric limited (used every shard of the decent colors on the actual quilt), I really had to piece the heck out of that which goes into the pipings. This took way longer than anticipated. I made 4 pieces at 85" of each color - teal and royal. The outer one is cut at 1-1/2", and the inner is 1-1/4". Both are pressed in half, and then the fine cotton cording is stitched into the crease, slowly, using a very fine coordinating thread. My best matching threads were 60wt Bottomline. I then stitched the two pipings to each other, thinking that this would be simpler to stitch to the quilt if they were a unit. This may or may not be true, but I went on the assumption that it was. The double piping is trimmed with the Hot Piping template (oh, why is the maker of this eluding me -- this is a fantastic tool!!). 7 hours later, I have piping that is ready to use. The quilt's edge has to be prepared to add the piping and binding to. I marked the curves onto the quilt using a circle template. This was actually very quick, compared to everything else I have done!! The marked line is stitched with a VERY short stitch, and then it is cut about 1/16" inch outside the line. The stitching keeps the bias edge from stretching. I am now ready to attach the piped binding, one side at a time. It is massively time-consuming, stopping at every inverted-V to position the piping. Total time -- 2 hours. It may sound like a lot, but when I stitch the binding, that will double this likely. I also ran a line of stitching using a smoke mono-filament thread between the two pipings. This helps them to lay much more snugly. The inner piping seemed a little floppy before this was done. I didn't know I needed to do this, but I preferred the look after I did. Time -- 1 hour. Yes, it is slow because you have to stay between the two and not stitch on the teal piping. So now I wait...the binding fabric has been ordered, but hasn't shipped yet. Hoping for end of this week. There will be a few crystals on this quilt too. I had the yellow, and added them (above), but others should be here Tuesday. There is a sleeve to make and attach -- That I will do right off because I have the fabric. Usually I need to mail off a quilt, and it doesn't yet have the sleeve! I have three weeks until my kids are on winter break. Sophie and I must take the 3 days that week to get her quilt, which is twin sized, quilted. 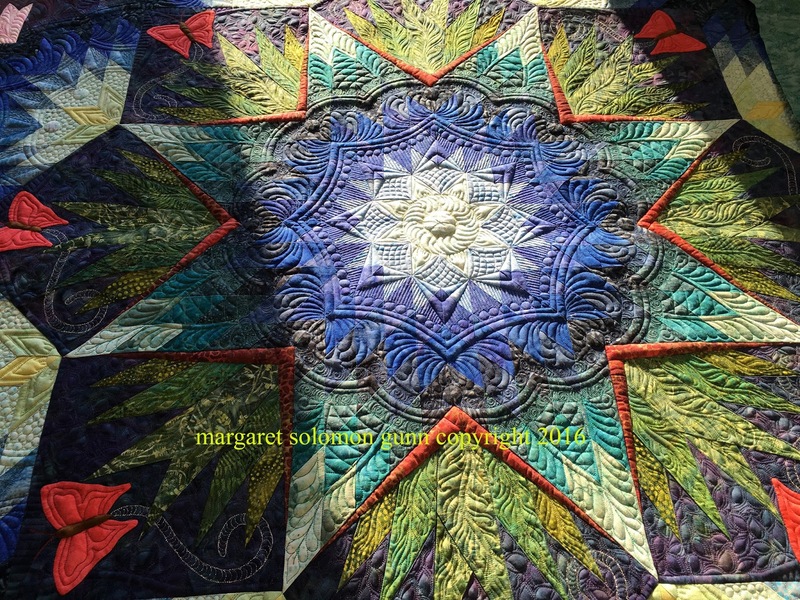 It is already entered at MQX, but not yet quilted! I will have that binding to stitch too (unless fairies come visit me!). Time is short. I'll continue this series on Finishing in another post. It is interesting to really know how long all of these last items take to do. I don't want to predict how long the hand-stitching of the binding will be, but likely on the order of 15-20 hours. I have a client's very monstrous Neimeyer Mariner's Star quilt on my frame on it's way to being finished. Maybe by mid-week, that is...sigh! It is 108" of enormous, and it does not lack from a gross amount of ruler work. "Good things come to those that are patient", I keep telling myself, as I quilt on. This is the last quilt before I will put my Swamp Carpenter's star back on for it's final finishes. There's not much time to spare, as the photos and entry are due in 15 days for MQX. I want to be able to get it blocked first so I know if it bleeds to heck and back. This quilt was made back in my carefree piecing days, when I rarely prewashed. One of it's predecessors bled horribly. It is a snowy day here in Maine today, perfect for quilting. My order of thread from Superior Threads arrived in record time. It has several I hope to use on this quilt, including one I am using for a little detail work. Normally I quilt the backgrounds with Kimono silk, which is a 100 weight - that's super fine. But on a couple of quilts last year I tried out their Tire silk - it is a 30 weight. It shows great as a trimming-out/detailing thread. For kicks, I got a couple spools of the black to outline these. Though it could be stitched on the longarm, I figured I'd do it on the DSM. Adding this thread in the past has been to cover-up when a stitched line was not quilt as I liked, or to enhance a part of the quilting. Here it is just for finishing. ...and here is a detail. Yup...I have machine appliqued these. This is a total first for me, despite taking classes on machine applique from Sue Nickel and Harriet Hargrave. I have just never liked the end result as much as hand applique. BUT...I wanted to finish this quilt in this decade, so I ventured out. It has a YLI nylon on the top and silk bobbin. It really is mostly invisible, and I am pretty sure once it is quilted it will be very much invisible. I also tried out the water soluble stabilizer that Sharon Shamber sells. 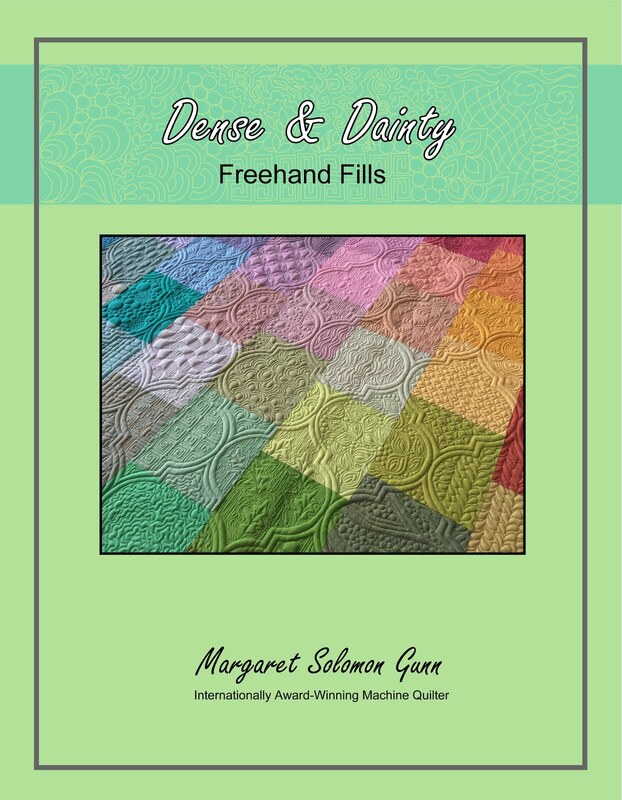 It came really well recommended by fellow applique quilters. I hope it does truly soften. My sample isn't too bad, but one of the beauties of Radiance is that the quilts are supple, and soft. Above is the same plate with a single line of detail stitching with the 30wt silk. It gives it just the amount of finishing it needs. And I think it might mask the nylon thread just a little bit. This is no fast task -- I probably have another 4 hours of this left! It's time to get my teaching stuff in gear, as I have 2 new classes debuting in under 3 months! You don't know how much I appreciate all of the comments!! Some days I think that there are 3 people that read this blog. Nice to know otherwise. While I sort of knew the direction I needed to go with these borders, adding black into my design did not come without a fair bit of trepidation. Black is just not a color I use, ever. Why and how the zebra print made it into this design is a huge question! One day I woke up and told myself I was going to find some zebra stripes, as though the fussy-cut hexie blocks were not wild enough. So, as you can maybe see, I did add a tiny micro-piping of black into the design. It is small and subtle, but I thing that is all this needs. I may also use it at or for the binding (if I get that much courage twice). The photo below has nothing stitched; it is all just glue-basted into place. Today I started stitching the first 4 of 12 plates into position. The piping follows the line between the orange and the ivory silk, even when it goes into the braid. This was my avant-garde twist on this design choice. It was easier than I thought it would be to attach the piping to the individual braid pieces before they were stitched to the background. I know that the piping isn't a whole lotta fun to longarm quilt beside, but I will manage. I love the look. No pain no gain, right?! You just don't know how stoked I am to get quilting on this thing. I know it won't be finished before the fall most likely, but I love this quilt nearly as much as I loved making her predecessor, Bouquet Royale. These are true hexagons, whereas that quilt had the elongated hexies. Both share my favorite colors though. 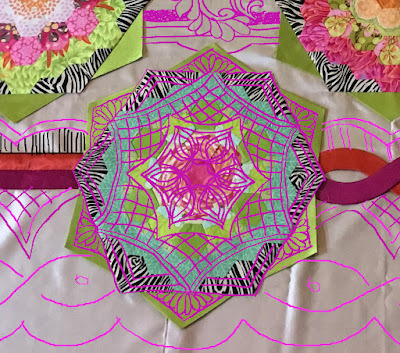 While I am busily bouncing quilting designs around for the background areas of this quilt, I can share one concept for the hexie plates. I am not entirely certain what direction I want the quilt to take, but it feels much like it's predecessor did, garden-like. I see flowers in each of the large hexagons, even though I finished them as stars. 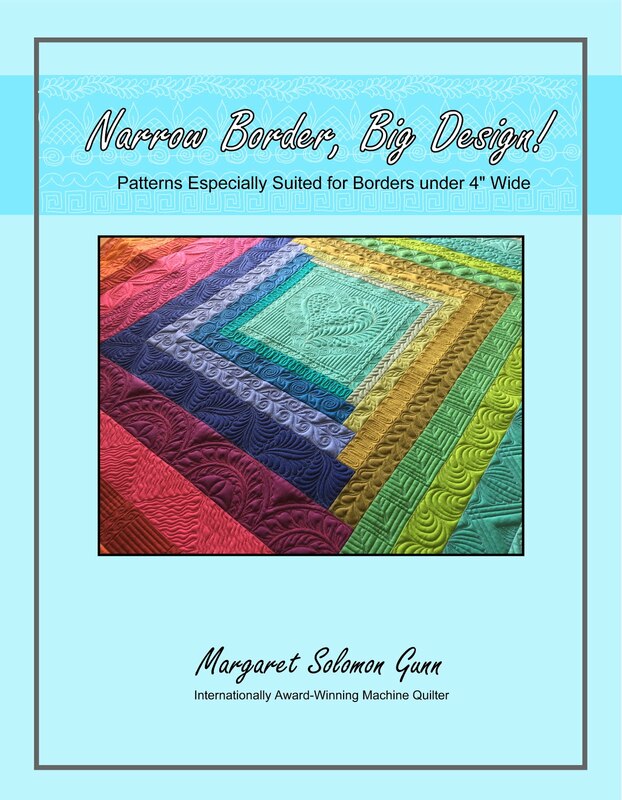 The print is challenging to quilt, so geometric designs are often more effective, as is a heavier weight thread. 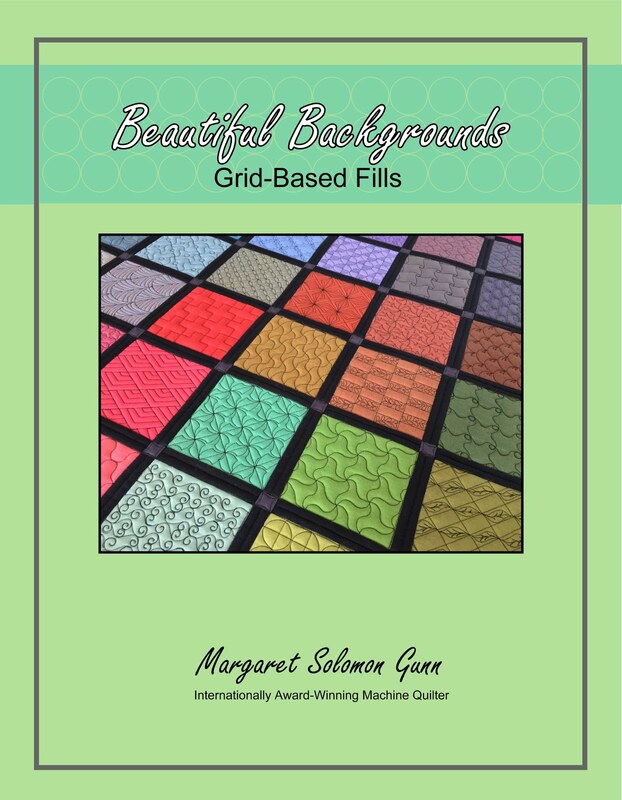 Save those prettier patterns for areas like the silk where they will show better. It is hard to believe that I made 3 more of these than I actually need!...They take something like 6-8 hours to hand stitch. No papers here...just a nice tracing line and running stitches. 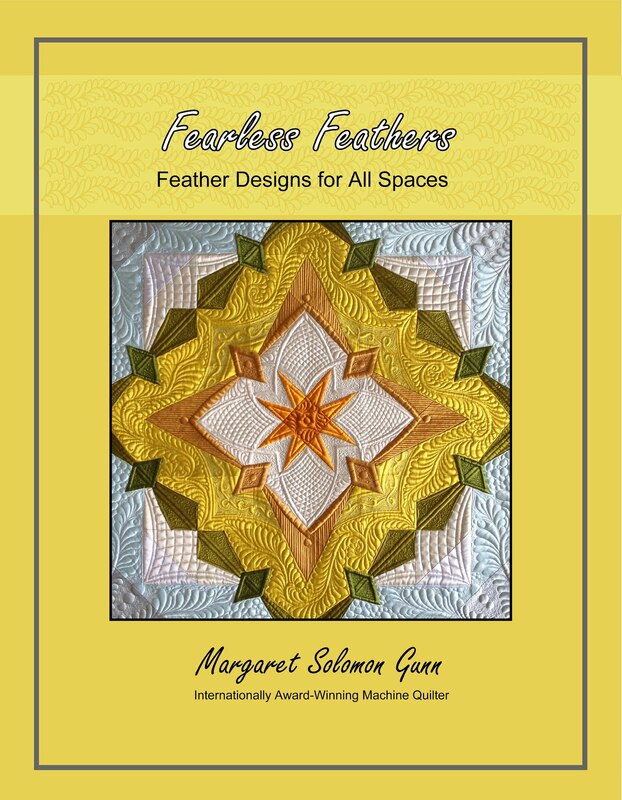 It enables me to press the seams to one side, which keeps the possibilities for longarm quilting endless. I never know when I might want to ditch stitch somewhere, and a pressed open seam makes that a total PIA! This is from early summer...that is about half of the blocks. There was really no plan yet, just blissful piecing. This one didn't make it's way to the front of the quilt. As much as I hate to not use blocks, an 82" quilt seems better than a 99" quilt! Maybe it will go into a charity piece or a label (or my "who knows what to do with this" box). Somewhere around September, I pedaled backwards. I had a dozen or so of these framed with pink/orange and black, which is very striking. BUT...these were the blocks that looked best in pink and orange, and the other 12 really did not, and I just couldn't find a cohesive color that blended well. Back to the drawing board. I had a fat quarter of a wasabi-colored green silk and sparks started to fly...I contacted the person that hand-dyed the first piece, and ordered 2 yards of this green. It was the perfect color with nearly all of the hexagon plates. I would make these cohesive by using just one color for the star points. Happily, I believe it worked, and the rest is history. 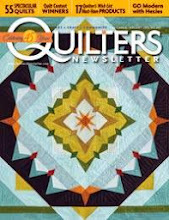 Getting back to client quilting now that the new year is here. First one up had been put off for a bit while I searched for inspiration. Large masses of blank, open fabric take planning (and a bit of courage). It feels good to have it finished, and I hope she likes the end result. This quilt has a single Hobbs 80/20 batt and is stitched with gold Glide, and dark blue & green So Fine threads. I was told that it is going on a bed and that it does not have to be as dense as another I did for her before Thanksgiving. The blue border is a whopping 10" wide! That width of border takes either a nice large feather, as I chose, or a good bit of subdividing (time, marking, and cost there). The feather is a bit more organic, to tie in with the leaves of the outermost border fabric. The fans are simply stitched, mostly because nothing really is going to show on them. The place to get bang for your buck is on the plain blue squares. I chose a stencil. I believe I have used this a couple times before (I like this one that much!). The stippling around the stencil, which is stitched in gold, pops the design. It's a pretty bed quilt. Next up on the weekend is a baby quilt, then onto a Neimeyer star of some kind. I have been puttering with just about every possible combination of border colors for this top this week for the last month. I have bought everything from these two colors, to a custom dyed lighter orange (which matched the champagne silk horribly), a deep green and a black. I am having a hard time getting on board with the black, but may still incorporate some black in the border/binding. It's time to move this top along, stop consternating about every possible color, and get the dang applique done. A lot of quilters I know are choosing a word for 2016. My choice word is this phrase "No Procrastination" ! Comment Moderation has been enabled for YEARS on my blog. I don't want spam, and if you find the fact that I moderate what is commented offensive, then my apologies. I don't appreciate comments from sales organizations and crazy people. It's my blog, and my rules. Hard to believe 2016 is here. Seems that yesterday was just 2005. Time flies. It's been a good, but long 12 days with everybody home. The moans of having to go back to school have been flying through the house all day. Despite actually working on this quilt some during the vacation, I am hopeful to return to a reasonable work schedule, barring any barfing kids or snow days. We all know there will be more of those. I have a growing list of things to tend to - an article, class preparations, clients quilts, and a quilt top of my own that I finally got the custom dyed silk for. I am most excited to get that top completed. 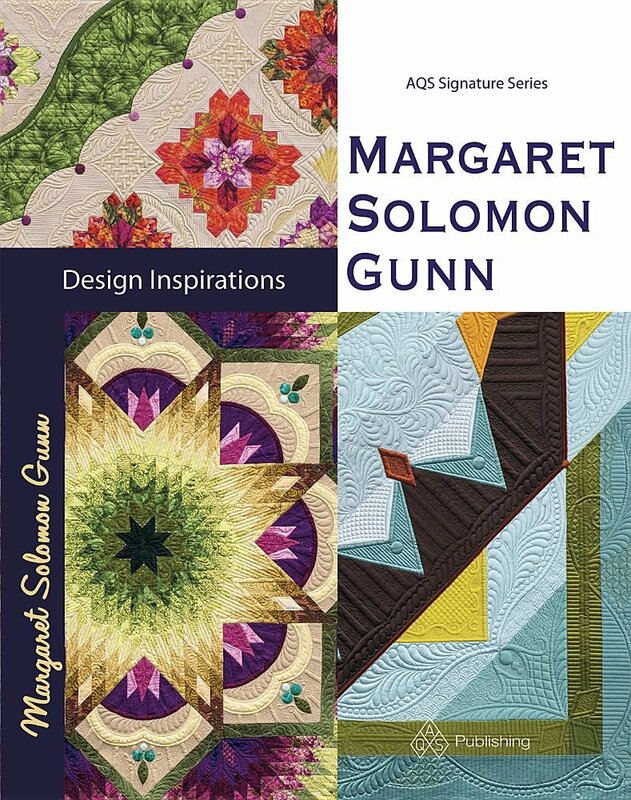 This is my Carpenter's Star...my pattern, designed and drafted by me, really...just like ALL of my quilts -- another Margaret Solomon Gunn original. I know many of you have seen this type Lone Star before; that is the beauty of certain blocks & patterns - they are used and reused, not copied. I have mostly done the quilting in a "just for fun" manner. It is apparent since I waited 4 years to finish this top that I lost my commitment. I fell in love with silk and this poor batik quilt just fell to the sidelines. I tend to create 2 quilts a year, and they often take 12-18 months calendar time to finish. This one was just put in a box and all but forgotten. It feels good to have almost finished it, but I am not really sure what it's destiny will be. For the first time, I tested a Hobbs wool/cotton batting. A Hobbs rep sent me several sample batts in November to try out. This is my first. Normally I use 80/20 under the wool, but I love the loft and density of the wool/cotton. I will definitely buy more. I also used lots of different threads. The batiks are challenging to get thread to show. If I wanted it to show, I went with the 40wt Glide. If I wanted it to blend, I used Invisifil and silk 100. There are also places where I pulled out the rarely-used metallic. Like I said, this quilt was my therapy quilt, so I played with and altered just about every one of my consistent choices from past quilts. Is it going to be a show quilt? I don't know. While I did many of my usually-careful techniques like knotting and burying, and being very neat, I just don't know if it has what it needs to have. I also know that my piecing and applique of 4 years ago don't hold a candle to what I do today, and more importantly what my standards for execution today are. My mojo and determination have taken a hit. I greatly appreciate the many messages about my previous post, and letting go of hurtful, jealous, hateful people. I still find the entire experience very challenging emotionally. I can know beyond a shadow of a doubt that my work is the design and execution of my efforts alone, but all it takes is the crazy ranting of one lunatic to derail things. I got to spend some time this week with my 9 year old while she works on her next quilt. She's working on a sewing machine that she won at a show in June. All kids that entered were given a machine. It's pretty cool to imagine being 9 and having a machine in your own room! It enables her to make 3 blocks and then fly off to do something else. I don't have to drag her stuff out each time because she keeps it all right there. She hopes to have this ready for MQX, but that really depends on finding time to get it quilted. Who knows when you are nine!...there are so many interesting things in your life! Her quilt again this year is Paris themed...she bought this Eiffel tower fabric and a bunch of green and pink fabrics when we went to Paducah together last April (she's a well-traveled 9yr old, having attended nearly 15 quilt shows!). While the colors are bold, they are totally her. She wanted to make something that would fit her bed -- it'll take a bit of time for her to quilt this!